This document introduces the Load-Balance/Route Policy. This feature allows network administrator to manage the outbound traffic more specifically. 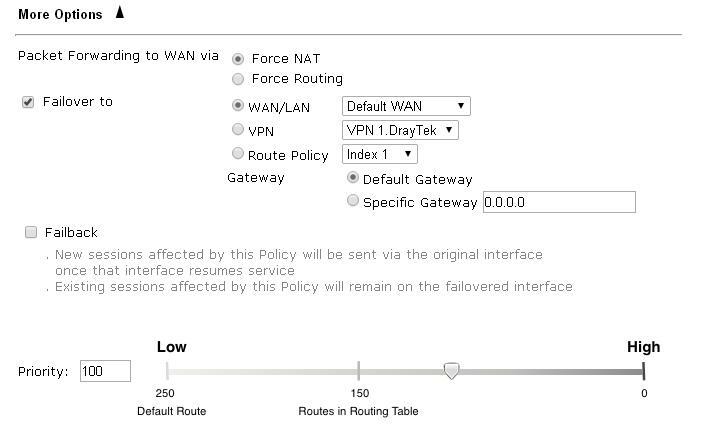 The Policy set in Load-Balance/Route Policy always has higher priority than Default Route and Auto Load Balance set in WAN >> Internet Access, and always has lower priority than the Firewall Rules. Administrator may also define a priority to this policy. To set up a Route Policy, just click on an Index number. At the bottom of the page, there are two configuration modes could be choose: the Wizard Mode provides a simple and basic configuration; while Advance Mode allows more options. 1. First, set the criteria of the packets to apply this policy. Enter the Source IP address range, the Source IP could be a single address if the Start and End are the same. Enter the Destination IP address range. The above configuration is an example that if a packet is sent from192.168.1.10~192.168.1.100 to 8.8.8.8, no matter what the protocol or destination port is, it will follow this route policy. 2. Next, we select an interface and gateway through which should the packet be sent if it matches the criteria. 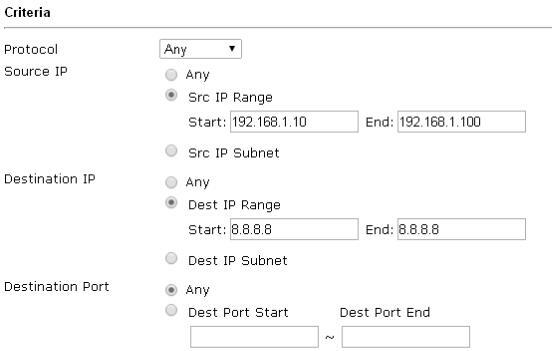 Select a Gateway IP. Note that if Interface is chosen to be a LAN, it is necessary to designate a specific gateway. The above configuration is an example that if a packet matches the criteria of this Route Policy, it will be sent to the default gateway then the destination through VPN1. Force NAT or Force Routing: If the packets are forwarded to WAN, Administrator could choose NAT or Routing on the outgoing packets. Failover to: Enables packet to be sent through other Interface or follow another Policy when detects a path failure in the original interface. The above configuration indicates that the packets will be sent through WAN2 when the original route is disconnected. Failback: When "Failover to" option is enabled, Administrator could also enable "Failback" to clear the existing session on Failover interface and return to the original interface immediately once the original interface resume its service. When Failback is not enabled, the router will only stop sending packet via the Failover interface when the existing sessions are cleared, and this might take a long time because some application will keep sending packet once a while. Therefore, Failback option is recommended if Administrator want the traffic go via the primary interface as soon as possible. Priority: Administrator may set priority between 1 and 249 for this Route policy, where smaller number indicates higher priority. When two policies are having the same priority, the first (according to the policy index order) matched policy will be implemented.